I have my project picked out for Sept. - M8 armored car with some Blackdog accessories. I'll probably be building the Tamiya Hetzer. I already picked up the Eduard PE set, just need a good barrel and I'm set. Jeremy welcome to the Campaign! That makes you participant No. 41. 7 more to go for a good number! So, I'll pick up from Greg: What is everyone building? This campaign sounds good, I have been thinking about some 1/48 tanks for a while. I am leaning towards the Tamiya Crusader. I will browse my stash and/or LHS sales and finalize before September, but for now the Crusader interests me. Welcome Stephen! A Crusader would certainly be a good choice. I see you've immersed yourself in the campaign and chosen our banner! Good choice! 3 weeks to go! I just ordered the M8 armored car figure set from MIG (same artist that does Total War Miniatures). Need to think up a little scene now. Greg, thanks for that link and for keeping the interest in the campaign up while I'm absent (3 more weeks of military duty). I will be doing a list of all the participant's projects so we can keep track of all the different projects. I'll get going on that after my service. I am in. I will build an M4 DV. Welcome Chad! I notice we now have 50 participants! Nice! At least one in-progress picture must be posted in the forums. I tried my hand on a participants list. It's pretty empty at the moment but as your "before build"-pictures come in I will update the chart. Feel free to tell me what you think about it and if there's anything I can improve. Also, I'm planning to do a feature on this camapign once it's over, so I would appreciate several pics of your finished build. I’ve noticed that I’m not mentioned on your list, so here’s my project. I’m going to build Wespe Models GM T15TA into a Danish Army version surrounded by Danish troopers. I´ve previously been in many campaigns but only received my “bare” for only one; so I may need some support on how to do this right. I’ve been contemplating enlisting for a while and have finally decided take the plunge. Mine will be a simple build of Tamiya’s Cromwell Mk IV. My first in this scale and my first in a scale larger than Braille Scale for quite a few years. It should be interesting and I’m looking forward to September now. Well now! 52 already! My list is already obsolete. I'll update it next weekend. Kenneth, you should go to to http://www.armorama.com/modules.php?op=modload&name=Campaigns&file=index&req=showcontent&id=401" TARGET="_blank">this page and click on enlist to become number 53. No worries, If you have any questions just ask them here. Chris, welcome to the campaign. Your selection will be noted in the list next weekend as I'm away during the week. Been a long time since I entered a campaign,and Ive never built a 1/48th kit,but I just happen to have AFV clubs Tiger1 late in the stash.Yeah ok Im in I might learn something along the way. I hope this should be my "Brfore build photo) ? I will build the Tamiya Stug G,with Hauler Schurzen,and Legend Stowage,and maybe some figures. That is a great kit to build,the only thing I didn't like were the tracks. Yeah I agree, Im ordering the AFV club single links set. Just finished up my Campaign, so I have time on my hands. 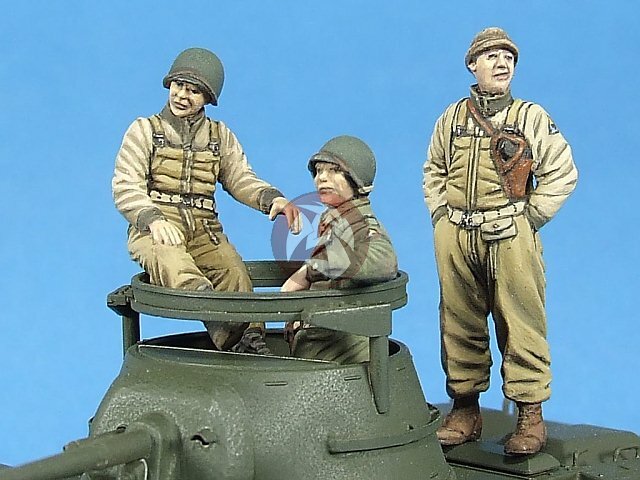 Actually Jan (tread geek) completed a very detailed 1/48 Sherman. Inspiration enough for me to go ahead and make the ONE 1/48 scale Sherman I have. The funny thing is all the extras I have for it. All for a Tamiya 1/48 early M4 Sherman. I usually just work in 1/35 so this will be a challenge for me due to my chunky fingers and bad eyesight. For me 1/48 scale is easier - less encrustment with tiny detail than today's 1/35. I was about to start my Tamiya KV-2 when heard about this on Track48. I can wait until Sept to start it. If all goes well, I might get the courage to do the old Bandai flak 88 way on the bottom of the stash pile. I´m in ... and probably with the new Tamiya´s Jagdtiger. I´m completely sure that we´ll really have fun with this! Welcome to the campaign I saw your excellent AFV-Tiger around,and that was some fine work !! Welcome, new enlistees! Sorry for the late reply, off the internet during the week. And I won't have time to update the list this weekend, have to get back to my unit this evening. Kenneth, that sure does qualify for the before build. I think it's time to get some pre-build pics up now, so keep them coming! I'm planning to build the Tamiya M4A1 with a few extras. I have a Verlinden base, but I haven't decided if I want to use it or not. The quality isn't great. I'll post another photo of the kit after the campaign starts and I crack open the box.